eggless pancake recipe | pancakes without eggs | eggless pancakes with detailed photo and video recipe. a flat and thin, round-shaped cake recipe prepared mainly with plain flour, milk and butter. the recipe is prepared very similar to south indian dosa recipe and is cooked by spreading the pancake batter on a frying pan. 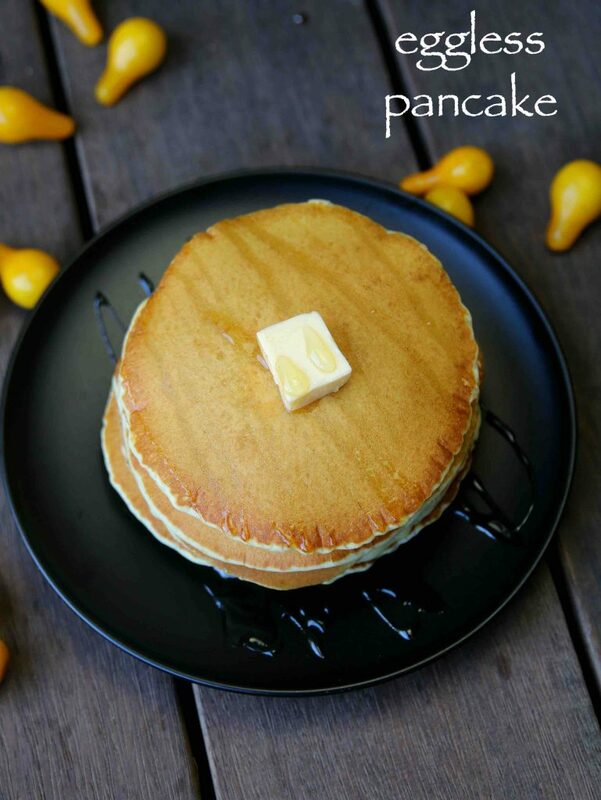 pancakes are generally served for breakfast and are usually topped with fruit jam, honey, cream cheese and dry fruits. eggless pancake recipe | pancakes without eggs | eggless pancakes with step by step photo and video recipe. there are several variations and varieties to this hugely popular pancakes recipes. each country across the globe has its own variations and style which varies with its thickness, way of preparing and of course with its servings. this recipe is a simple pancake recipe without egg and topped with thick honey. to be honest i am not a huge fan of pancake recipes as i personally do not like sweetness in my breakfast. hence i avoid recipes like eggless pancake recipe, sweet breads, oats or muesli bars and stick to conventional savory south indian breakfast. but i don’t mind having pancakes without eggs as a dessert recipe especially filled with fruits, cream and chocolate sauce toppings. moreover if you assume pancakes are only sweet in taste and ideal for desserts than you are totally wrong. i have already shared one of the savory pancake and i am big fan of it. basically, it is a potato-based pancake or locally known as aloo cheela recipe which can be an ideal alternative for your day to day breakfast. 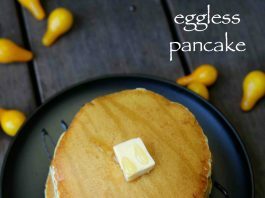 furthermore some tips, suggestions and serving ideas for eggless pancake recipe. 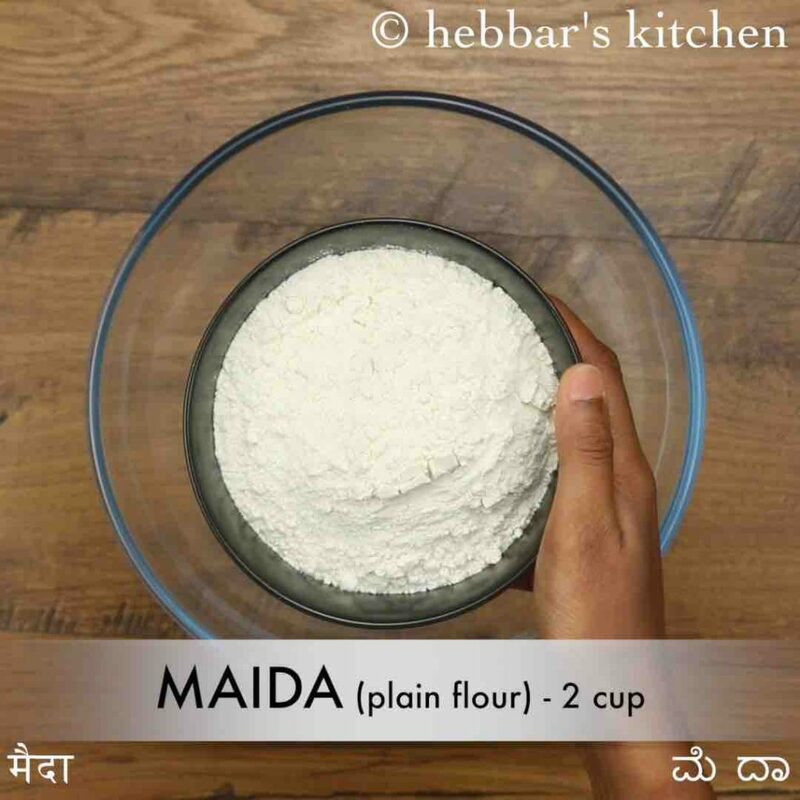 firstly, i have used plain flour or maida flour and added baking soda separately. alternatively you can use store bought self raising flour or even cake flour and skip adding baking soda to it. it should equally taste great with less hassle. secondly, i would recommend to use heavy nonstick pan or cast iron pan to fry these pancakes. 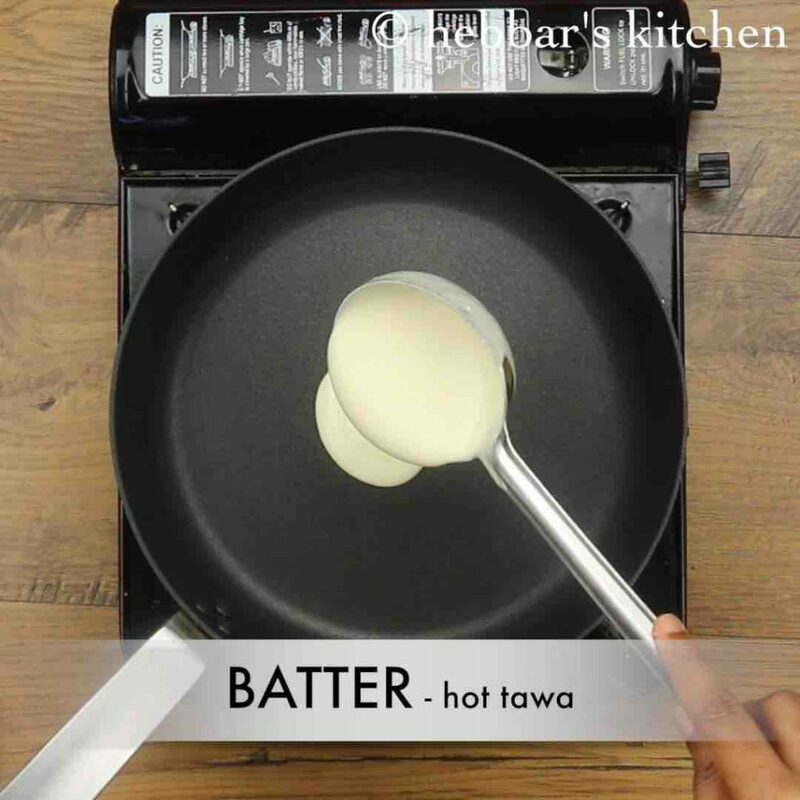 with heavy bottom pans, the intensity of heat would be less at the bottom and evenly distributed. lastly, the serving of these pancakes without eggs is completely open-ended. with a simple honey to combination of creams, chocolate sauce, fruit salad and even fruit jams can be topped before serving. firstly, in a large mixing bowl take 2 cups maida. you can alternatively use wheat flour / atta for a healthy option. 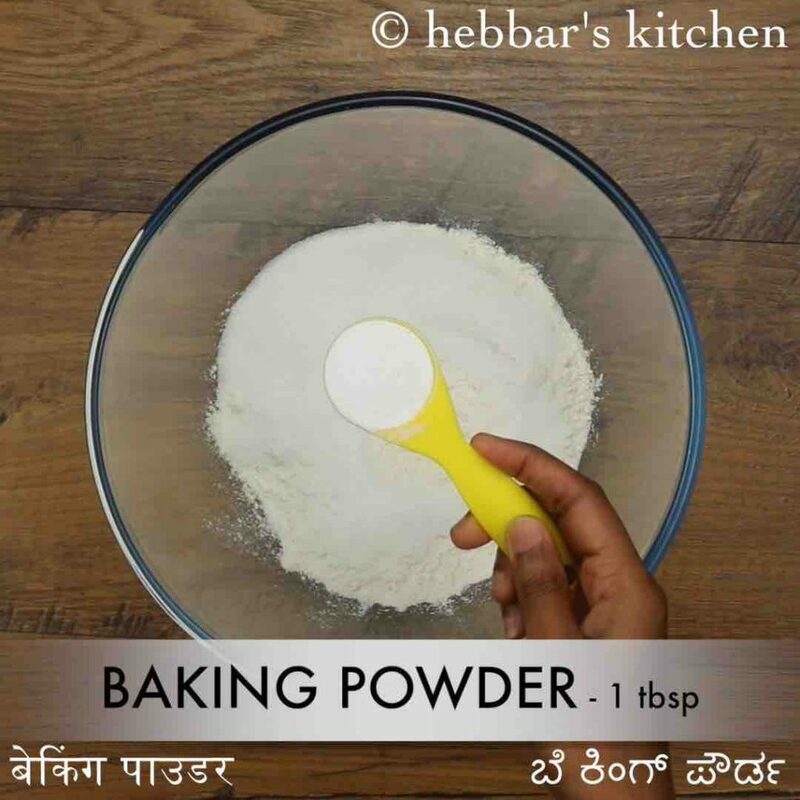 also add 2 tbsp sugar, 1 tbsp baking powder, ½ tsp baking soda and a pinch of salt. 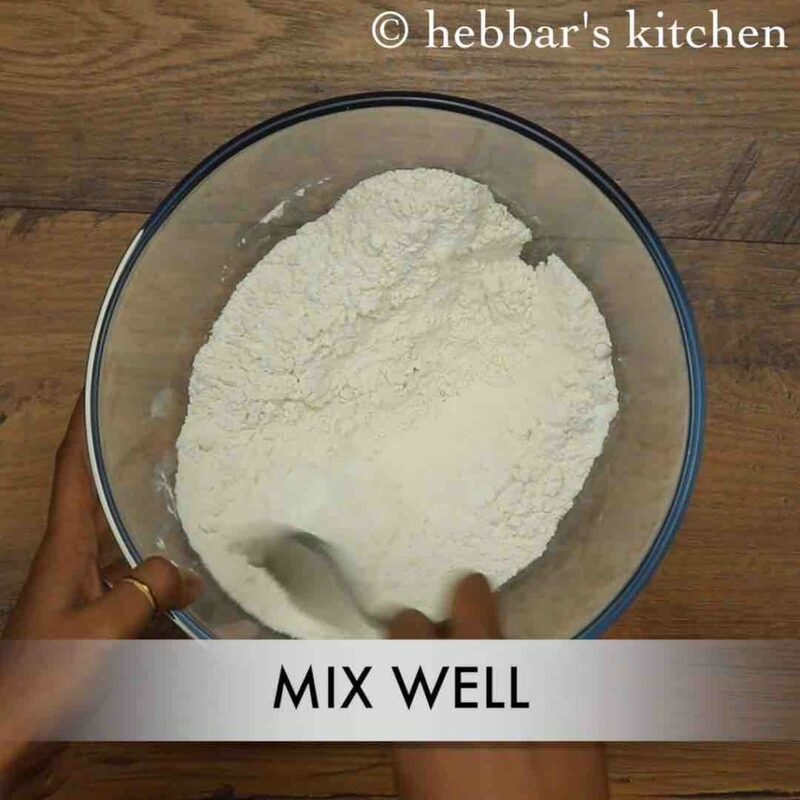 mix well combining all the dry ingredients well. further add 2 tbsp melted butter, 1 cup milk and combine well with the whisk. 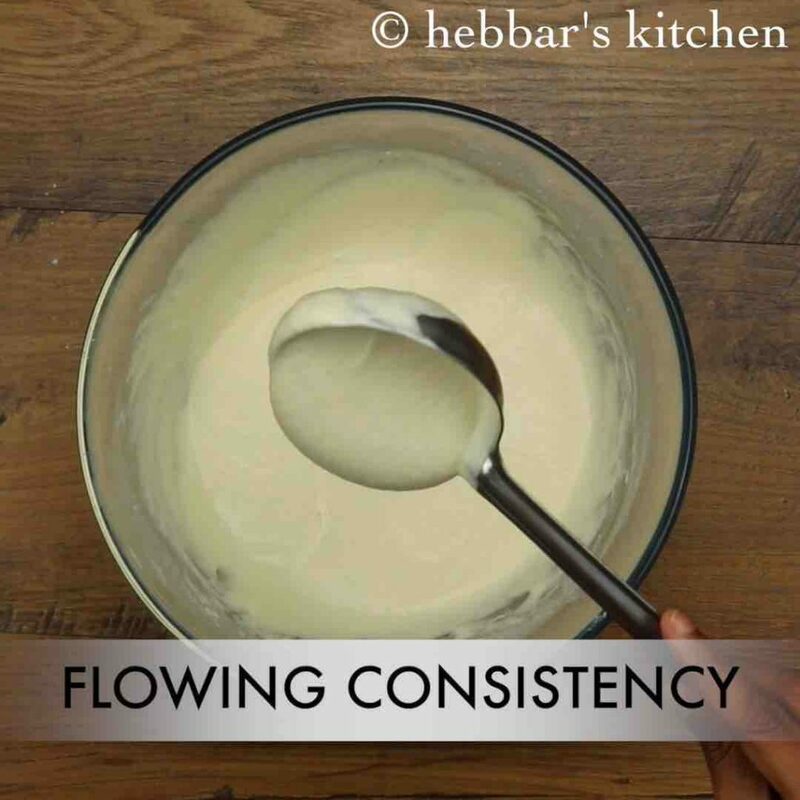 additionally, add ½ cup more milk and make smooth flowing consistency batter. heat a nonstick pan and grease with butter. pour a ladleful of prepared pancake batter. do not spread. simmer and cook for 2 minutes or until bubbles appear on the surface. 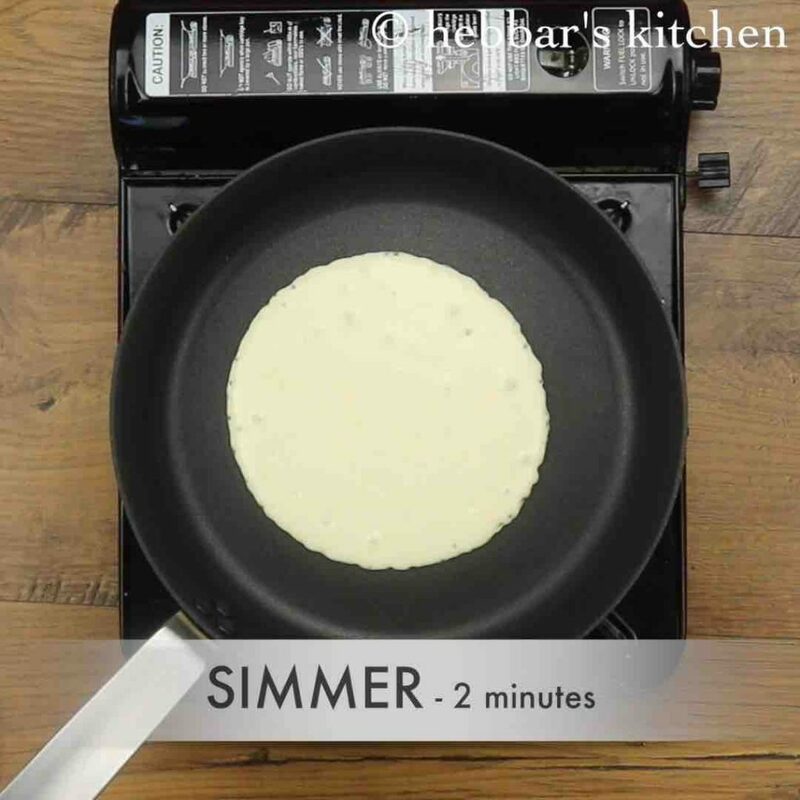 flip over the pancakes and simmer for 1-2 minutes or until cooked through. finally, serve eggless pancake with some butter and honey or maple syrup on top. 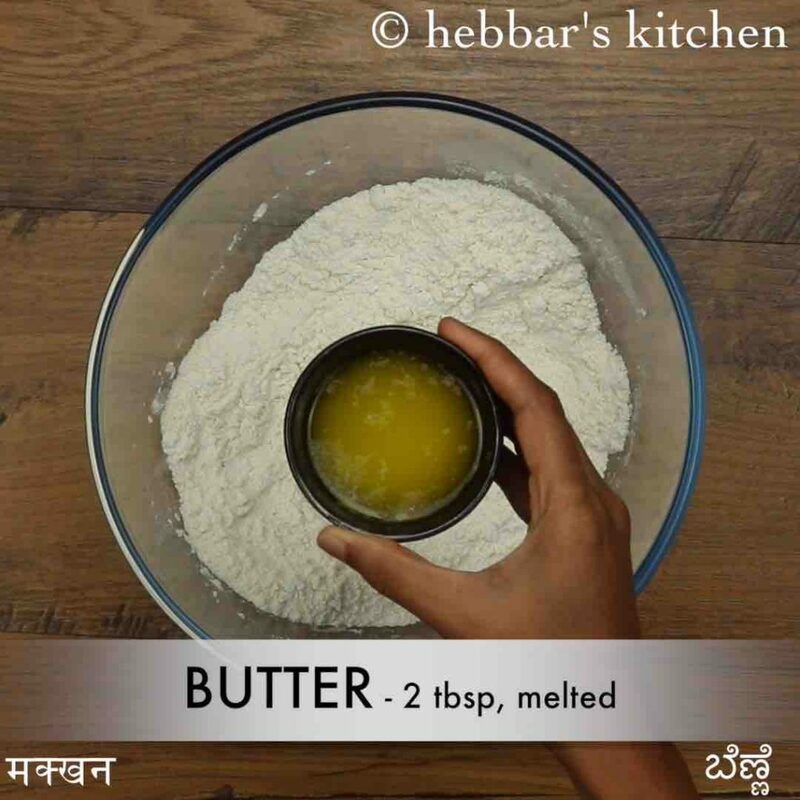 firstly, to make pancake softer, use buttermilk in place of milk. also, add banana puree to make eggless banana pancake recipe. 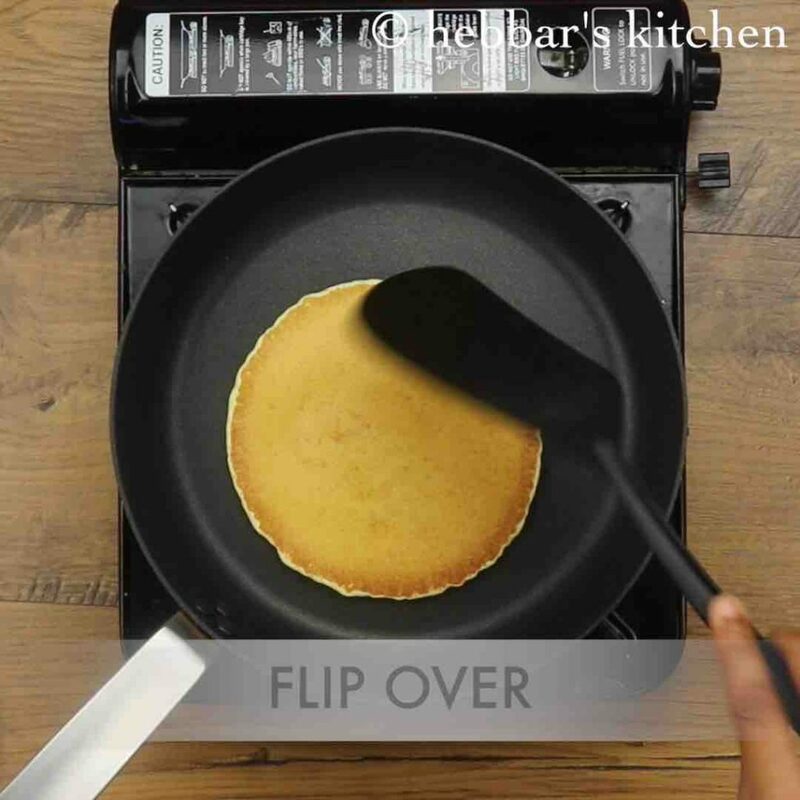 additionally, use non-stick pan to make pancakes, else it will be difficult to flip over. 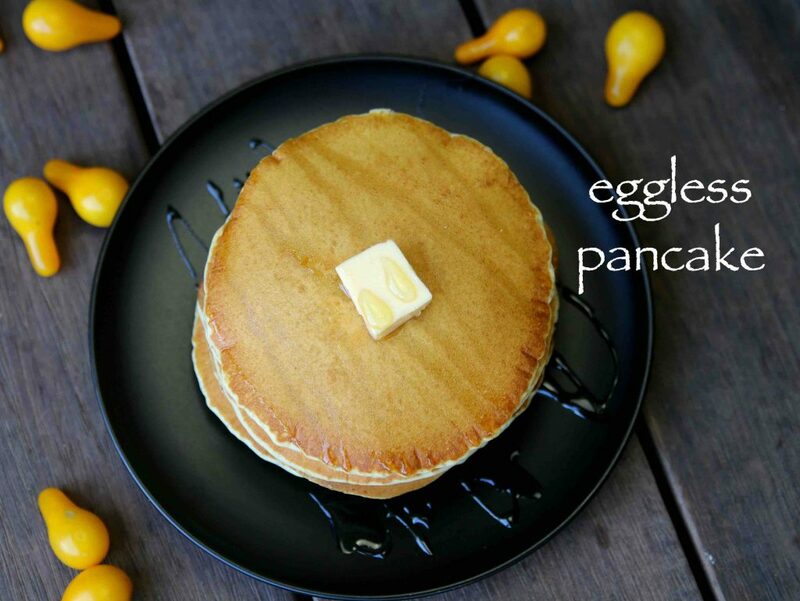 finally, eggless pancake tastes great when served warm so cover with a foil once prepared.